Join 700,000 registered investors, developers and real estate buyers in our ever-growing online marketplace. A Bid4Assets account grants you access to all private and government auctions on the platform. This guide will give you the tools and knowledge to secure your next investment. 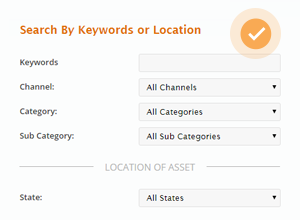 Before you can begin participating in Bid4Assets’ auctions you must create an account. This is required for all auctions on the platform. Registration is free and there are no monthly fees required to maintain your account. 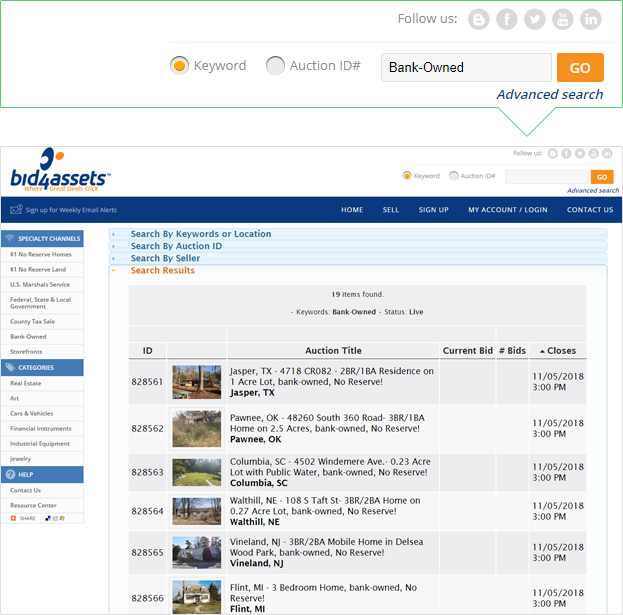 To register for a Bid4Assets account click here. Once you’ve created an account, there are several ways to search for general property lists or find a specific auction you are already interested in. Looking for $1 No Reserve Land? Bank-Owned Properties? County Tax Sales? Tell us what you are interested in using the search bar at the top of all site pages and we will direct you to a relevant list of value properties. 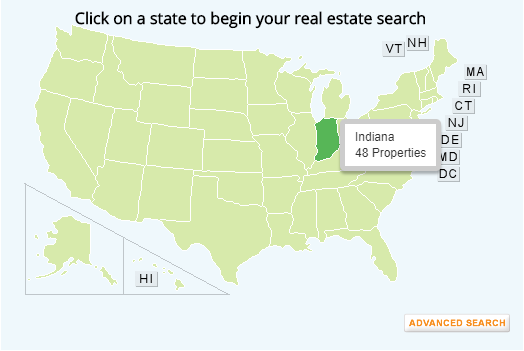 You can view the amount of properties available in a specific state, at any time, from the Bid4Assets homepage. Just highlight the state you are interested in and select it to view a full list. 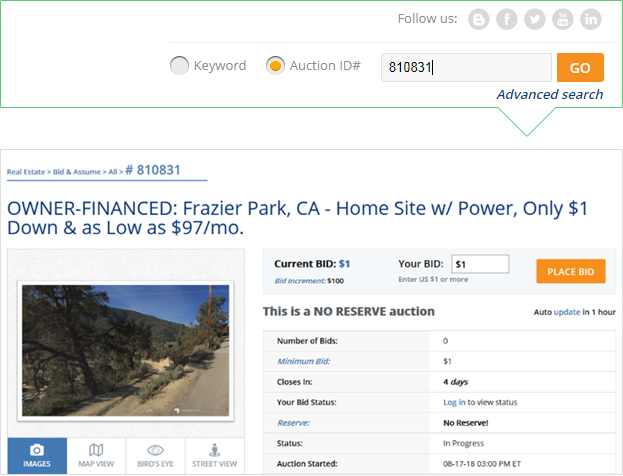 If you are looking for a specific property and you know its Auction ID number, you can enter that number into the top search bar at any time to go directly to that auction’s page. 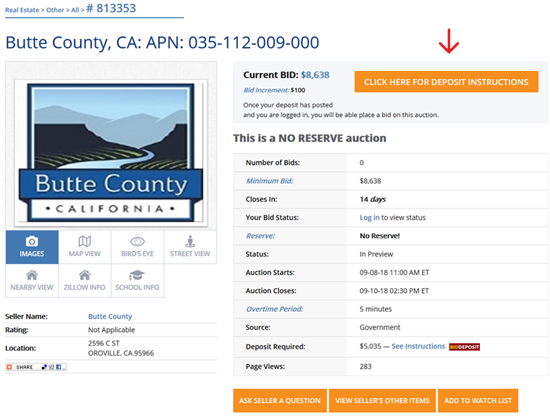 If you do not have the Auction ID# for the property you are interested in, utilize the Advanced Search tool to search your property by state and zip code. 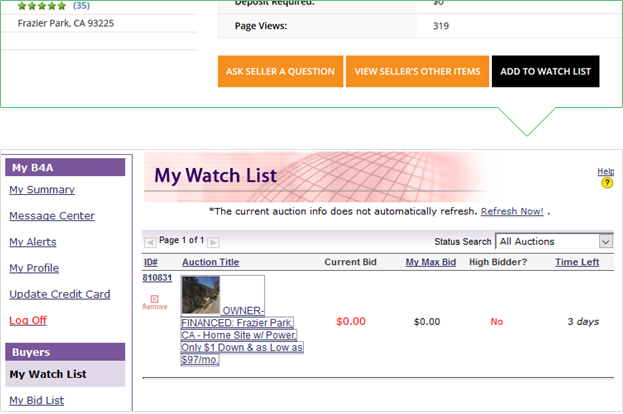 Finally, you can add an auction to your Watch List from that auction’s bidding page. By doing this, you will be able to access that auction and view its status at any time directly from your account’s main page. Once you’ve created your account and found your auctions it is time to start bidding! Bid4Assets requires all users to provide a valid credit card prior to placing their first bid. This card will only be charged in the event that you win an auction but do not follow-through with the payment. Bid4Assets utilizes an auto bid system, meaning you can enter the maximum amount you’d be willing to pay for an item and the site will automatically continue bidding up to that amount on your behalf. You can also manually bid up by an auction’s increments if that is your preference. Most government-based auctions hosted on Bid4Assets require submission of a bid deposit to participate. The following methods are currently accepted for submitting bid deposits to Bid4Assets. All Bid4Assets bids are treated as legally binding agreements. If, after winning an auction, you do not submit payment in the time allotted by that auction’s terms or you alert its seller you do not intend to submit payment, your account will be marked as non-performing. If this happens, the credit card you have placed on file will be charged a non-performance fee ($250 for real estate auctions/$100 for all other auctions) and be suspended for a minimum of 60 days. To enhance the integrity of jewelry, coin and artwork sales on Bid4Assets, we maintain special policies for these sales. These policies are (a) a policy regarding appraisals, grading cards and certificates of authenticity that accompany jewelry, coin and artwork assets posted on the Web site and (b) a jewelry, coin and artwork return policy. Both the Jewelry, Coin and Artwork Appraisal, Grading and Certification Policy and the Jewelry, Coin and Artwork Return and Refund Policy will be automatically posted on all assets within the three categories listed on the site.